I’m so excited to announce that I naturally gave birth to a healthy (9 pound!) baby boy almost a month ago. If you’ve followed my health journey here then you know I was told by doctors I wouldn’t be able to have a baby because of my diagnosis, but after making these changes I was able to reverse things and we were able to naturally conceive. 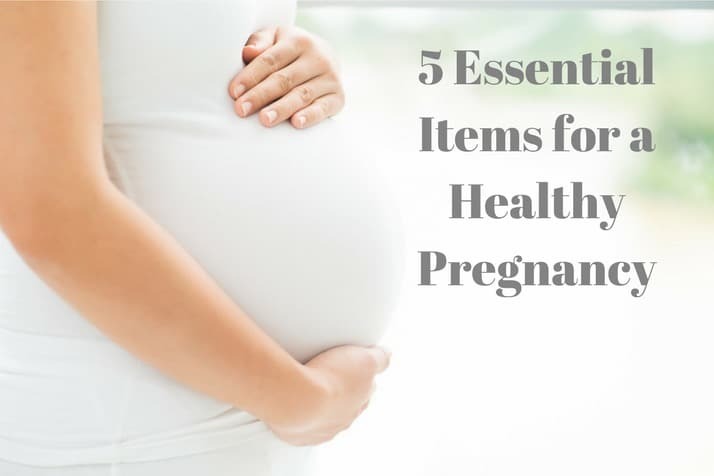 So I thought I’d share with you 5 items that added to the success of my healthy pregnancy. These tips are not just for pregnant women. They’re also good for anyone trying to live a healthier lifestyle. All of these are still apart of my daily life to make sure I can continue to be healthy as well as my baby through breastfeeding. 1. Vitamin D is one supplement that pregnant women need, and so does everyone else. Studies have shown that women who take higher doses of vitamin D when pregnant have less complications like preeclampsia, gestational diabetes, preterm births and more. It’s also beneficial for non-pregnant people as it helps fight diseases, boosts weight loss and reduces depression. I take this brand. 2. DHA is an omega-3 fatty acid that is a primary structural component of the human brain, skin, retina and cerebral cortex. It is recommended that pregnant women consume 200 mg of DHA a day, but it’s not so easy to do through just diet because pregnant women can’t be encouraged to eat more fish because of the risks of the mercury. Studies have shown the mercury in fish actually outweighs the benefits of the DHA. Fish oil supplements do have DHA, but these products have shown to carry over the pollutants found in the fish. The best way to get DHA is through algae, which is where the fish get if from so it’s basically cutting out the the middle “man”. I buy pure algae DHA pills online. Like Vitamin D, everyone can benefit from taking this. 3. When people find out I don’t eat fish or meat, one of the questions that I get all the time is “are you getting enough protein?” And just because you’re pregnant does not mean you need to eat meat to get “enough protein!” My blood levels were always fine and I attribute a lot of that to eating beans each day. Beans also help to keep you regular so I never had to deal with constipation while pregnant – thank goodness! What a woman eats when she is pregnant has shown to play a role in the body weight of a child even as they mature – not just birth weight. This study shows that protein consumed from animal sources, primarily meat products, during pregnancy increased risks of overweight offspring. It can also increase the pregnant woman’s risk of getting gestational diabetes. 4. Greens are another thing that women should aim to eat a lot of while pregnant and not pregnant. I will admit I couldn’t get a lot of greens in during my first trimester, but once I entered my second trimester, I was all about my salads and smoothies again. Leafy greens are loaded with essential vitamins and minerals especially folate, which is very important for pregnant women. The nutrients found in things like spinach, kale, chard and romaine help protect the baby from developing congenital defects like spina bifida. You should always consult your doctor before making any changes to your lifestyle. These are things that helped me stay healthy during my pregnancy so if you know a pregnant woman who could use this advice, please pass it along. Congrats on a healthy baby! Boys love their mamas! He is a sweetie! Thank you! Congratulations! And really great tips for healthy new mamas! Thank you, Allison. We are loving it! Congrats on your sweet healthy baby! Thank you for these tips, it must be spring time because the baby fever is real over here! Congrats!!!! My first daughter was a whopping 9lbs & 23.25″…naturally 🙂 Enjoy those snuggles!!! Wooo! You know what I am talking about 🙂 Thank you! Congratulations! And great article, lots of good information here! Congrats! This is so good to know!